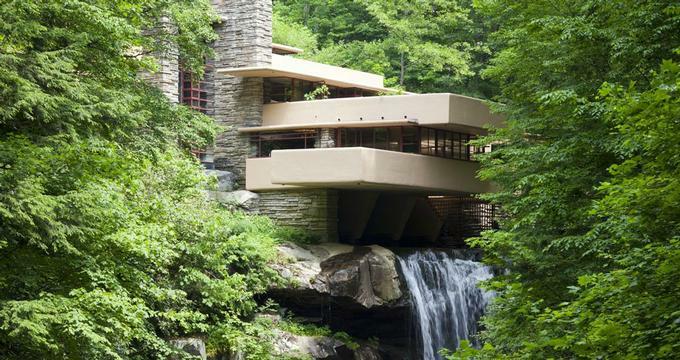 Located in Fayette County, Pennsylvania approximately 40 miles southeast of the city of Pittsburgh, Fallingwater, also known as the Kaufmann Residence, is the best-known architectural work by 20th-century American architect Frank Lloyd Wright, open to the public as a living history museum for guided tours. Frank Lloyd Wright, recognized today as the “greatest American architect of all time” by the American Institute of Architects, was born on June 8, 1867. Throughout his 70-year career, he was noted as a prominent international architect and interior designer, completing 532 structures and designing over 1,000. He also designed custom stained-glass and furniture elements for many of his houses and office buildings, authored more than 20 books, and traveled throughout North America and Europe as a public speaker. Wright is best known as the father of the Prairie School architectural movement, which used organic architectural principles to create structures and urban planning strategies with an emphasis on harmony between society and nature. In 1934, Wright was introduced to Lillian and Edgar Kaufmann, Pittsburgh residents and owners of the Kaufmann’s department store chain, by their son, Edgar Jr., a former student of Wright’s at his Taliesin estate studio. The Kaufmanns commissioned Wright to create a weekend home residence for the family at nearby Bear Run, a secluded natural area in Fayette County with the Laurel Highlands area of the Allegheny Mountains. Wright’s plans for the residence were famously created spontaneously in two hours prior to an impromptu meeting with Kaufmann Sr., featuring a cantilevered design located directly above the area’s natural waterfall. Construction on the estate began in December of 1935 and was completed in October of 1937, at a total cost of $155,000. The home was used as a weekend residence for the Kaufmann family until 1963, when it was donated to the Western Pennsylvania Conservancy by Kaufmann Jr. The following year, it was opened to the public as a living history museum. Today, Fallingwater is a designated National Historic Landmark, noted as Wright’s greatest career achievement and one of the top examples of American architecture of the 20th century. In 1991, it was chosen as the greatest all-time work of American architecture by the American Institute of Architects. The estate has been acclaimed by a number of major publications, including Time magazine, and was chosen as one of the Smithsonian Institute’s 28 “Life List” sites to visit. As a major American architectural icon and tourist destination, the home has served as the inspiration for a number of cultural works, including the fictional Vandamm residence in Alfred Hitchcock’s 1959 film North By Northwest. At its opening, it was also the subject of two exhibitions produced by New York City’s Museum of Modern Art, including the 1938 traveling exhibition A New House By Frank Lloyd Wright. The estate is designed as a weekend residence for three occupants, featuring a 5,330-square-foot main house divided roughly equally between interior spaces and outdoor terraces. Wright’s love for Japanese architecture and design is reflected in the house’s style, particularly in its integration of outdoor spaces into the home’s design. The natural environment of Bear Run and the waterfall beneath the home is heavily integrated into its design, offering ample views through the use of broad window expanses and extensive balcony space. The home’s interior is designed according to a cantilevered split-floor design, featuring three floors of rooms, including two master bedroom suites, a music corner, and an office suite. A large fireplace hearth in the home’s living room utilizes natural boulders found at the site during construction, left unwaxed to evoke the image of rocks within a stream. A stairway within the living room also leads directly out of the house and down to the nearby stream, and a connecting space between the estate’s main home and 1,700-square-foot guest space utilizes water from a natural spring. A four-bay carport, servant’s quarters area, and spring-fed swimming pool are also included within the estate, added in 1939. More than 180,000 visitors tour the estate annually as part of guided tours, which may be purchased online or by calling the estate’s visitor services hotline. A variety of tours are offered throughout the week, including two-hour standard guided tours of the home for visitors ages six and up. In-depth tours are offered for visitors ages nine and older, offering access to additional spaces within the home, and throughout the summer months, brunch tour packages and sunset tours are also available. Custom focus tours may be booked for small groups, including curriculum-incorporated tours for elementary and secondary school groups. Landscape hikes of the surrounding Bear Run area are also offered on Saturday mornings, and discounted grounds passes may be purchased for visitors wishing to observe the home’s exterior. The Fallingwater Cafe, located within the estate’s Visitor Center, offers light American fare crafted from locally-sourced ingredients. The estate’s Barn at Fallingwater, constructed in 1870 and located adjacent to the estate property, may be rented for private special events, including weddings, corporate conferences, and nonprofit organization events. A variety of public special events are also offered annually, including a lecture series and a Twilight Tour and Concert in August.